“There is nothing permanent except change.” So goes the quote from the ancient Greek philosopher Heraclitus. In life things arise, they abide and then they dissolve. Our asana practice also mirrors this cycle of impermanence. In Vinyasa we connect to the smooth flow of our breath and movement. As we move through each pose, we are given a brief moment to settle (sometimes only a breath) and then once completed, it transforms into something new. Our lives and our thoughts are like this too – each moment arises, is there for just that moment and then dissolves as the new moment takes its place. On the mat this can embody a feeling of sweetness. The flow becomes a dance that attunes us to the body and the breath in each moment. It invites presence. That same sweetness can be found in everyday life. Each action has a beginning (arising), its brief moment of sustaining (abiding) and then it moves to completion (dissolving). Resisting this flow is futile – it is the law upon which everything is bound to. So when you are struggling in a difficult moment, take a deep breath, and remember that this too shall pass. Carla Wainwright is a past SOYA lead trainer for the 200 teacher training in Mexico and the 300 hour Upgrade. She will always be valued for her dedication to SOYA. Every Wednesday evening in Mackenzie, BC, for the past several years I have had the wonderful opportunity to share yoga practices and teachings with an amazing community of yogis, hungry to practice yoga while delving into yoga philosophy and lifestyle through book study. What started out as a Mindfulness yoga class inspired by our first “Book Study” group. We have read a variety of yoga books by various authors such Michael Stone, Donna Fahri, Judith Hanson Lasater, Ram Das, Tara Brach. The conversations have been rich and enlightening. 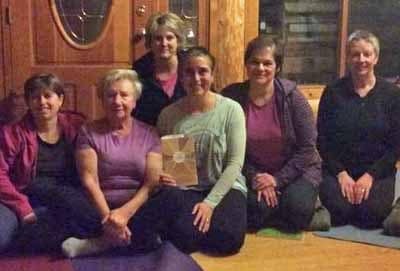 It was during our book study that I had the opportunity to mention the launch of Mugs’ new book, “Letters from the Yoga Masters”. This was a perfect book for diving into the philosophy and lifestyle of yoga, presented in the words of the Masters themselves! The group unanimously agreed that we should make Mugs’ book our next read. When I mentioned to Mugs we would be studying her book, she very graciously offered to schedule a time to talk to the group over SKYPE. She spoke to the group on two occasions – once after the group had met a few times and had read through a few chapters, and then again when they finished the book. Having the author call in and share in the discussion with the group really made a book of this depth accessible. Mugs answered questions on everything from doubt on the path of yoga to the greatest gift Hari gave her – humility. Mugs spoke so passionately about her teacher Hari, his teachings in the book, and her lifelong journey of Yoga. The calls lasted over an hour and the group found that speaking to Mugs gave the book more meaning. The group was truly grateful for the opportunity to have their questions answered and we even got a sneak peek at three chapters that were cut by the publisher. Thanks again Mugs!! Over the winter Mugs has also led a book study group in Mexico, meeting weekly over 13 weeks to practice the techniques from the book. If you have a book study group and are interested in studying “Letters from the Yoga Masters,” email mugs.soya@gmail.com to arrange a time for her to chat with your group!